If you see 1 to 2-inch pathways through grassy areas that are sprinkled with clippings and droppings, and the pathways end at 2- inch-wide, open burrows, you may have voles in your garden. Voles are commonly called meadow mice. The most easily identifiable sign of voles is their extensive surface runway system with multiple burrow openings to the voles’ underground nests of grass, stems, and leaves. Unlike moles and gophers, voles do not construct dirt mounds at the openings to their tunnels. Overhanging vegetation often obscures their runways. In the San Francisco Bay Area voles can exhibit a variety of colors—brown, gray, and even some red, and most have gray under parts. They measure about 5”-7” in length, nose to tip of their short tail (which is less than 3 inches long), and have stocky bodies and short legs. Voles tend to be less shy than gophers and moles and can sometimes be seen searching for food in the open. They do not hibernate. If they are lucky enough to elude their natural predators (coyotes, snakes, hawks, and owls as well as humans) they may live out their short natural life of 12-14 months. It is important to remember that vole populations are cyclical. Their population fluctuates unpredictably from year to year, with peak populations occurring every 2 to 5 years. A bumper crop this year may be followed by a much smaller number of voles the following year. Voles spend the majority of their time searching for food such as grasses, vegetables, and grain crops. Sometimes their gnawing may girdle young trees. Their gnaw marks on tree trunks tend to be irregular and at various angles, 1/8-inch wide by 3/8-inch long and 1/16-inch or more deep, smaller than the gnaw marks of rabbits. Killing voles by trapping is a temporary measure at best. It often leads to repopulation of the property by other voles who take advantage of the newly available ecological niches left by the voles that were killed. Using poisons and traps is inhumane and can harm children, pets, and other wildlife. Poisons also travel up the food chain. There are much better ways to discourage voles. A garden with plentiful weeds, ground cover, heavy mulch, un-mowed lawn, and unmanaged areas with dense vegetation under which to hide is vole-friendly habitat. To eliminate cover for voles push mulch 3 feet away from trees; clear out tall weeds adjacent to gardens; remove woodpiles and brush; keep lawns mowed short (2-1/2”); replace bird feeders with birdbaths to prevent spilled seed that attracts voles and other unwanted wildlife. Tilling the soil can discourage voles by removing cover for their runways and burrow openings. Grow plants such as daffodils that are less attractive to voles than preferred plants such as tulips. The safety of voles is jeopardized when they can be seen in the open. Weed-free buffer zones as much as 10 feet wide around areas requiring protection make it difficult for voles to cross the open strip into the garden. While wide buffer zones are most effective, even cleared spaces as narrow as 10”-15” can inhibit their movements. Protect your trees and plants with hardware cloth. If voles are gnawing on saplings, 1⁄4-inch mesh or hardware cloth can be wrapped around tree trunks, buried 6-8 inches deep, and bent outward at a 90° angle underground. Quarter-inch or 1⁄2” hardware cloth can be laid on the ground after planting vegetable and flower seeds. As the plants grow through the mesh the voles will be blocked from reaching roots and tubers. Protect flower bulbs by soaking them in repellents, such as Shotgun Deer and Rabbit Repellent, that contain thiram, a bittering agent. If you use a repellent on a food crop, make sure that the label says it is safe to use on food crops. Other repellents such as Ro-pel, Plantskyyd, and hot pepper sauce containing capsaicin can be applied to plants according to the label’s directions. They will need to be re-applied periodically. Other repellents that have been used with some success are castor oil spray and spikes that emit sound inserted into the ground. Sharp materials such as diatomaceous earth, Soil Protector, and coarse gravel, dug into the soil around a flower bed or sprinkled on vole runs, is abrasive to voles’ touch, encouraging them to leave. One garden advisor recommends sprinkling diatomaceous earth and Bon Ami cleansing powder around trees and shrubs, and applying it in combination with one’s lawn food. He suggests sprinkling Bon Ami alone into planting holes. Use traps only as last resort—be patient and try everything else first. Humane Havahart traps baited with a mix of oatmeal or peanut butter can catch voles alive. Release them unharmed, without touching them, on your own property in a shrubby area away from your protected garden area. Be careful and gentle with them, as they will need to be in good condition when starting their new life away from your favorite garden area. Live traps can also catch other wildlife that you will need to release. Live traps should only be used as a last resort. Glue traps and sticky substances that trap wildlife when they touch or step on them should never be used. They cause great suffering and death to many species of wildlife, including birds, and even domestic pets. It is best to take preventive measures, especially habitat modification (which is surprisingly effective) before an upsurge in vole numbers occurs. Habitat modification is within your control. 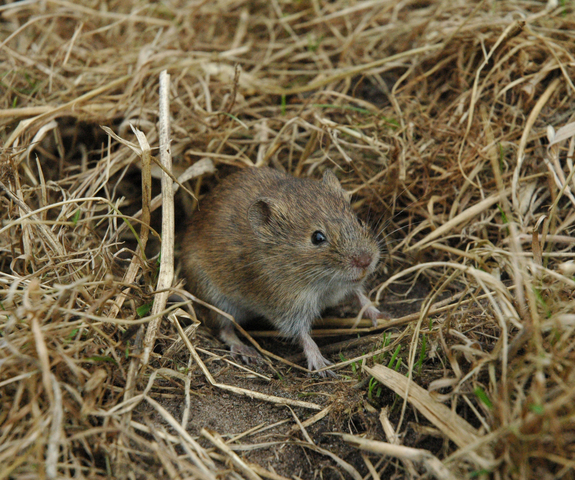 A cyclical increase in vole numbers due mainly to climate conditions is not within your control. Try a combination of the suggestions above for best results, and keep in mind that next year may be a down year in the cycle of vole population numbers. There may be many fewer voles in your garden—naturally.